Two children were among 18 migrants intercepted off the Kent coast in two small inflatable boats after crossing the Channel. 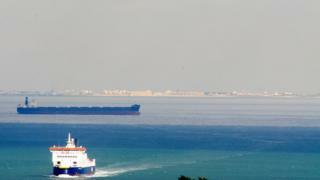 Five men, who said they were from Iran, were found in one boat about four miles south of Folkestone at about 04:00 GMT. A second boat with 10 men, one woman and two children on board - who claimed to be from Iran and Iraq - was found two miles from Folkestone at 05:00. They were all brought to Dover and transferred to immigration officials.